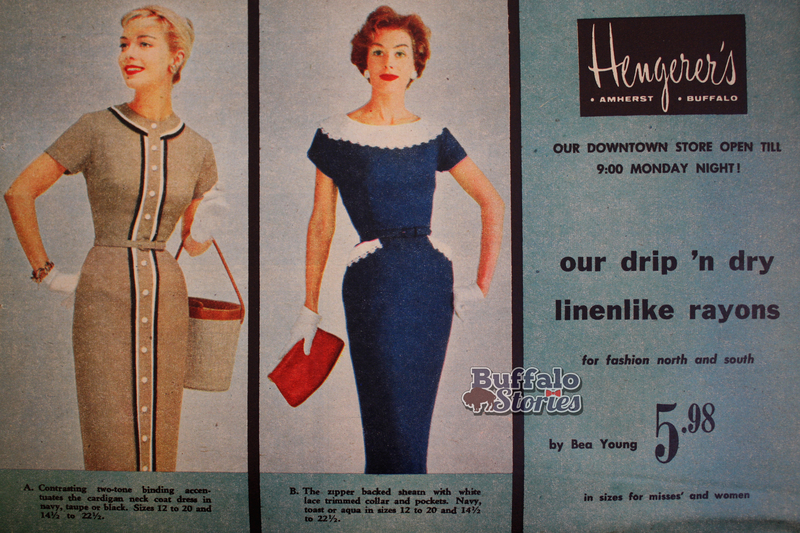 As we look at the glory days of downtown shopping this week, Hengerer’s is one of the memories that makes Buffalo Buffalo. 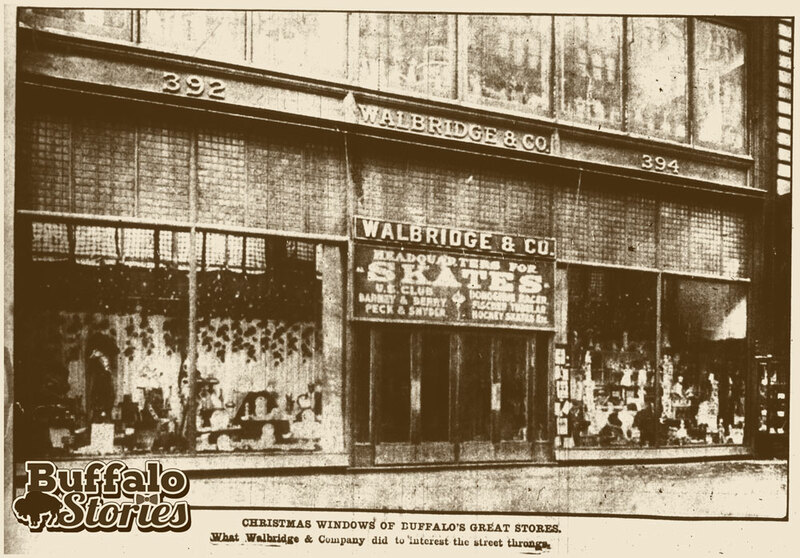 William Hengerer started selling dry goods on Main Street in the 1870s, and the tradition of the William Hengerer Company lasted well into the suburban shopping era. 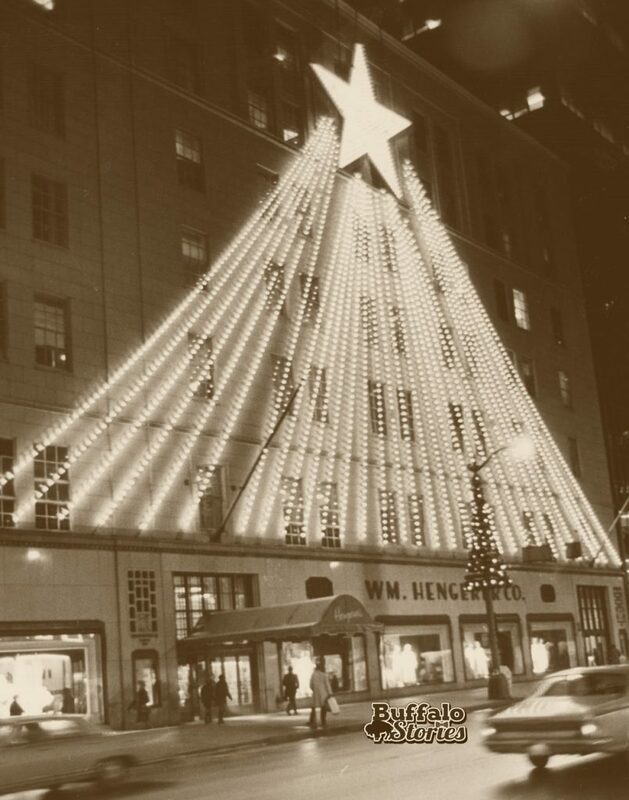 The 105 year downtown Buffalo tradition ended on November 5, 1981, when the signs for Hengerer’s at the downtown store and all the mall and plaza locations were replaced by new signs for Sibley’s. Workers replace the Hengerer’s sign with Sibley’s. 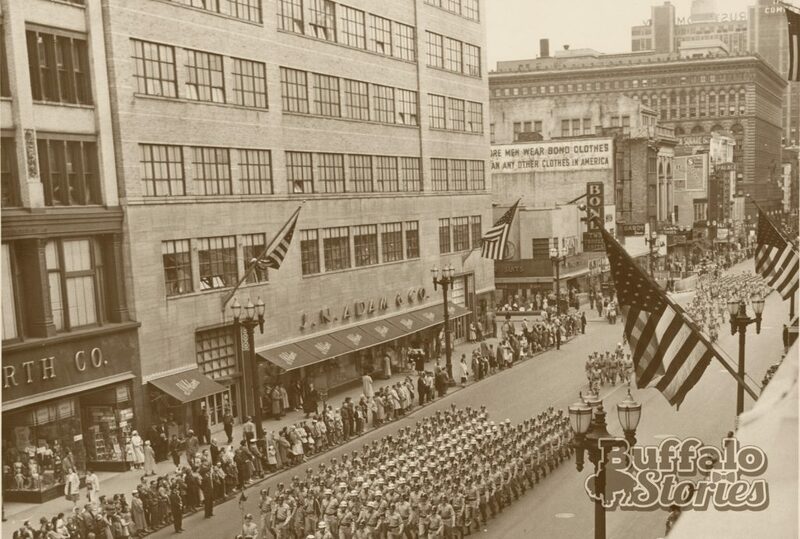 Sibley’s was a long time, heritage Rochester department store, and was owned by the same conglomerate that had owned Hengerer’s since 1916. 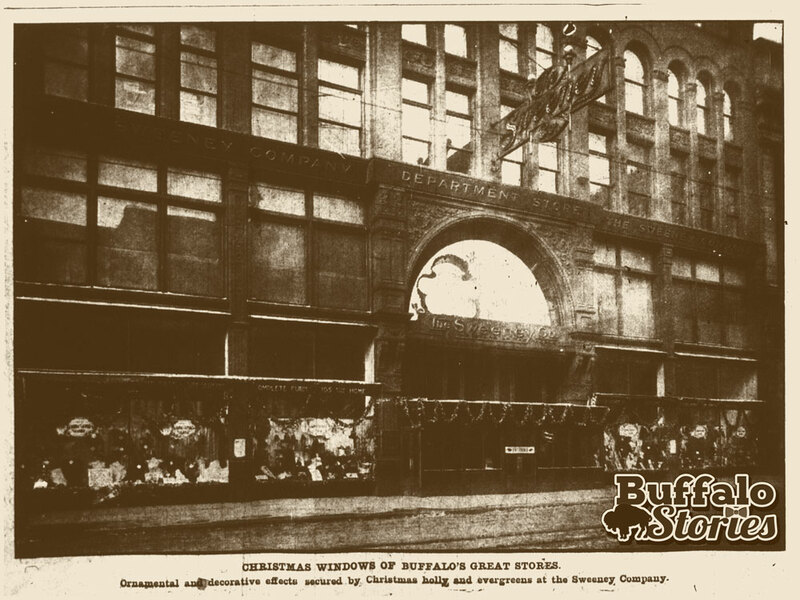 The downtown Hengerer’s/Sibleys store was closed in 1987, and Sibley’s was eventually merged into Kaufmann’s in 1990. Most remaining Kaufmann’s locations became Macy’s in 2006. 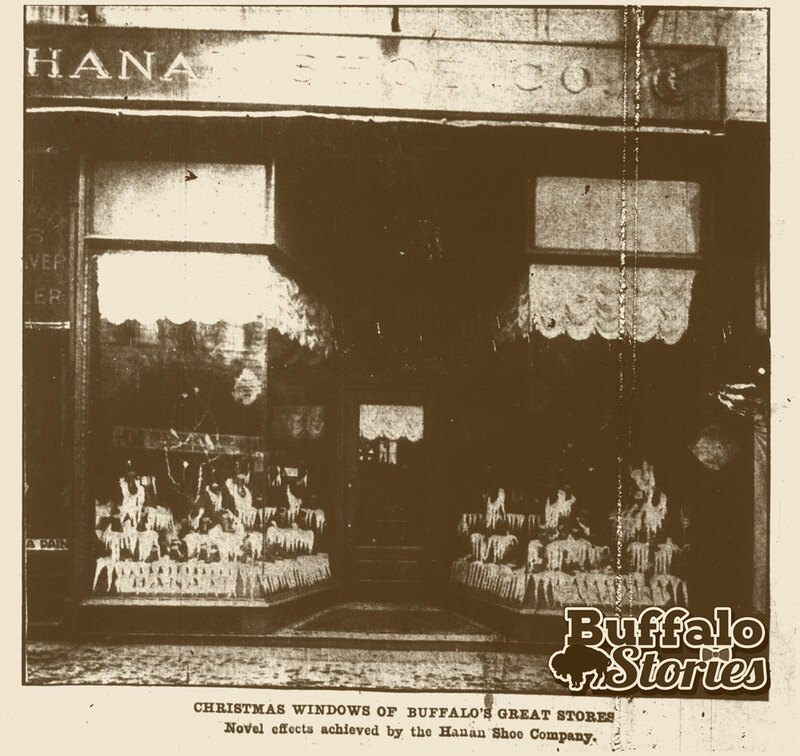 Hengerer’s—certainly one of the names that makes Buffalo Buffalo. 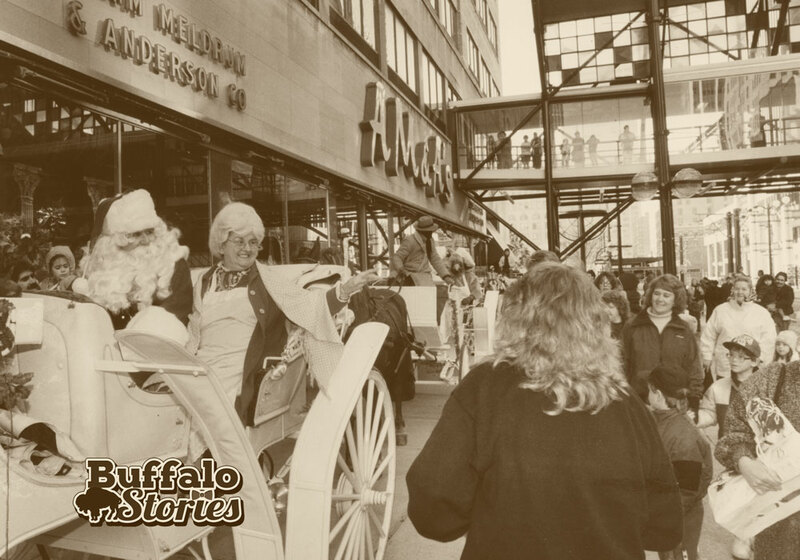 Like so many of our great cultural traditions in Buffalo, trying to pin down the concise history of our collective amber-hued fuzzy memories of Downtown Christmas shopping is difficult and can even get combative. 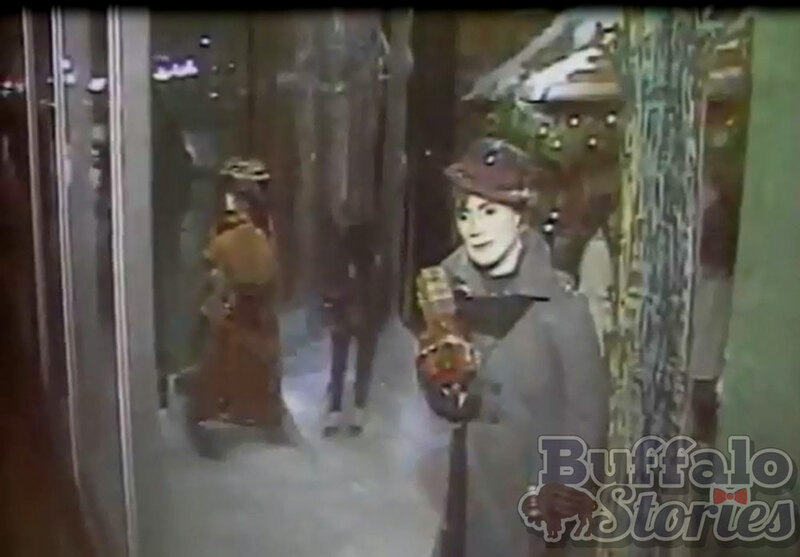 For many of us, all those warm recollections seem to get lumped into a generic category of “AM&A’s Christmas windows,” and to imply anything else is often met with side eye looks, and sometimes with outright hostility. 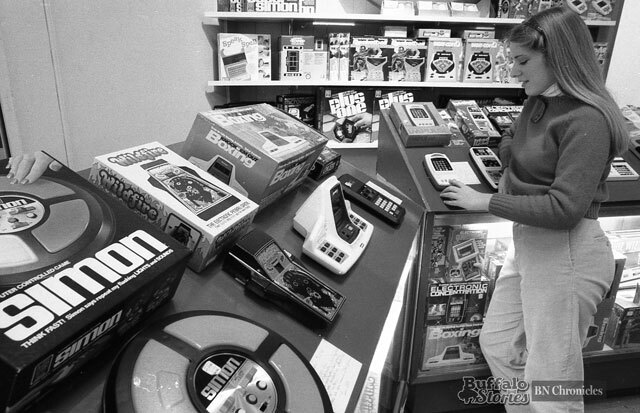 Through the decades, some stores moved, some changed names, all eventually closed. Taking the fuzz off memories and bringing them into focus with the actual names and dates can be dangerous business, but that’s the dangerous business we’re in. So here we go. 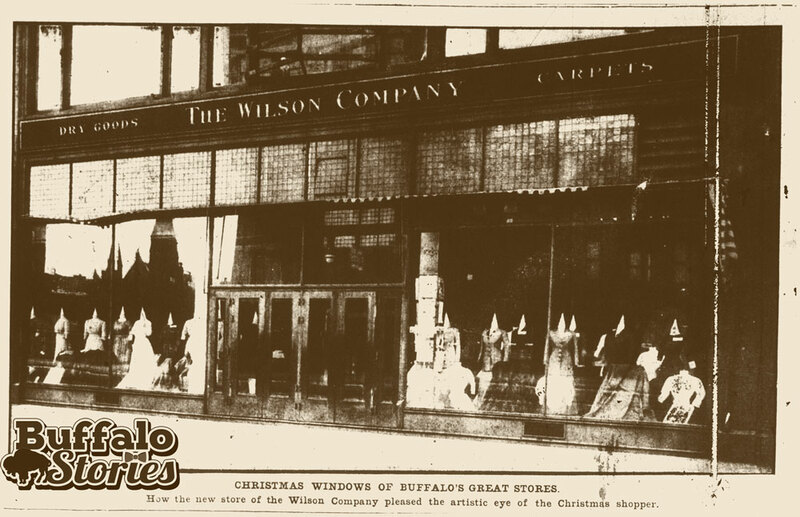 The tradition of decorating downtown stores for Christmas dates back before anyone reading this can remember. 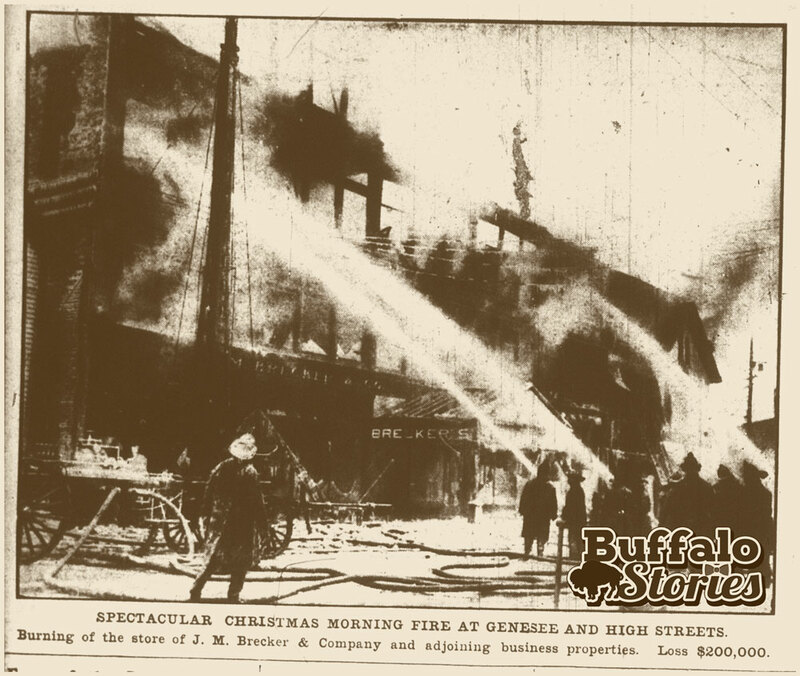 Downtown’s department stores were fully decorated, for example, for Christmas 1910. 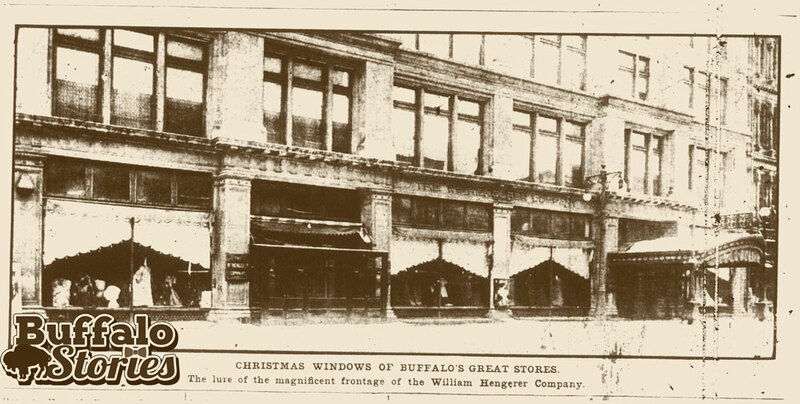 Since those stores—some with familiar names—decorated their windows more than a century ago, plenty has changed along Buffalo’s Main Street, especially in the areas where generations did their Christmas shopping. The most tumultuous change came between 1965 and 1985, the time when most of our memories were forged and influenced. The buildings we shopped in for decades came down, new buildings were put in their place, and traffic was shut down with a train installed in place of the cars. The one constant through all of that, our collective memory tells us, is those wonderful AM&A’s windows. 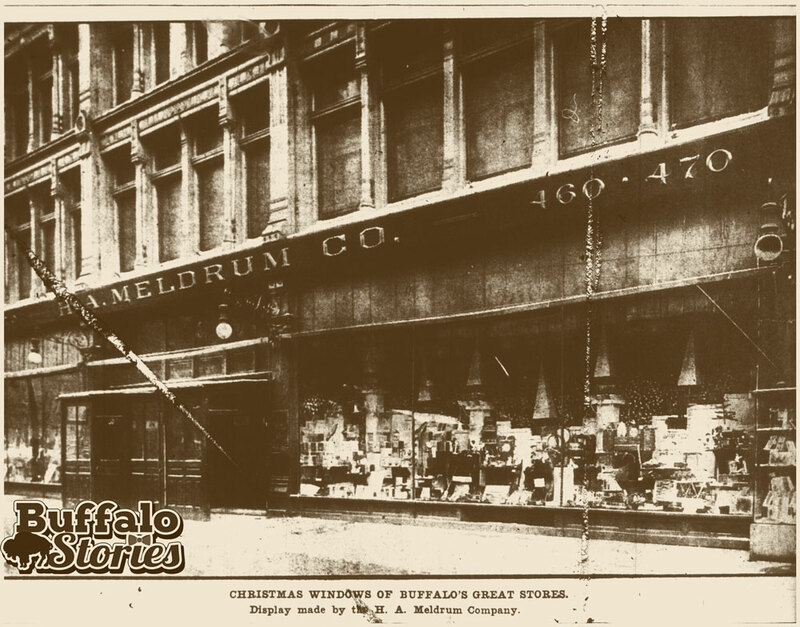 Adam, Meldrum, and Anderson was a Buffalo institution between 1869 and 1994, when the Adam family sold the chain to Bon-Ton. 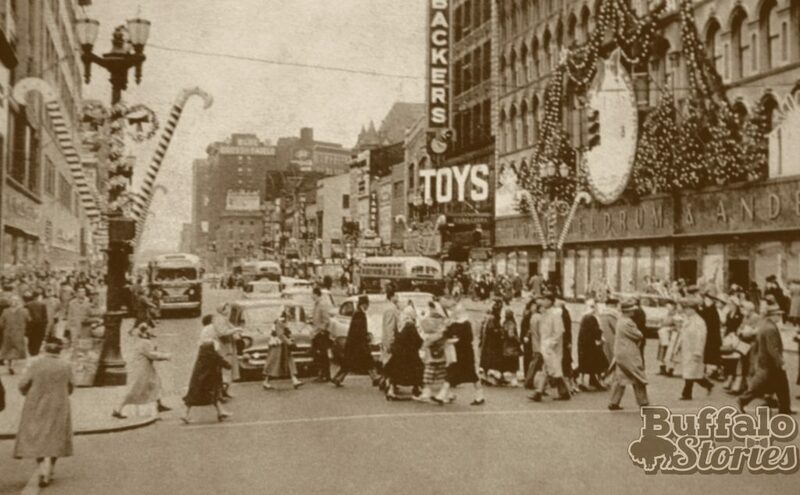 That being the case, for as long as anyone can remember, people off all ages would line up along the east side of Main Street, looking in those big AM&A’s windows, before going inside and taking the escalators up to AM&A’s Toyland starring Santa himself. Well, here’s where the hostility sometimes comes in. 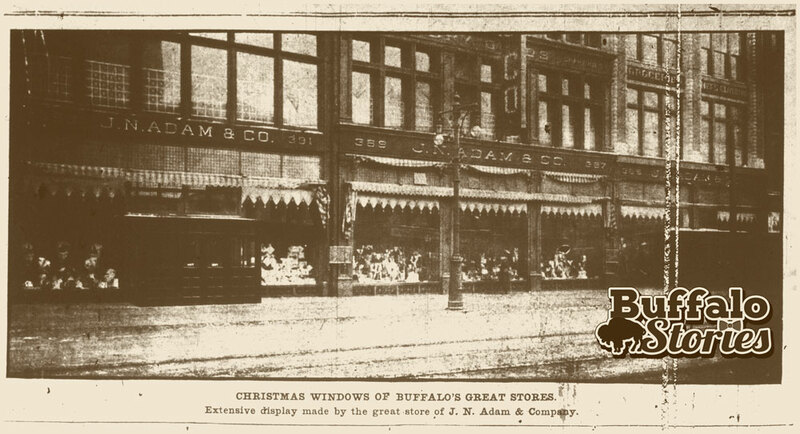 If you remember looking at windows in that spot before 1960—you weren’t looking at AM&A’s windows, you were looking at the windows of JN Adam & Co.
For more than 90 years, AM&A’s was located directly across Main Street from the location where the store’s flagship downtown location was for the final 34 years of the chain’s existence. 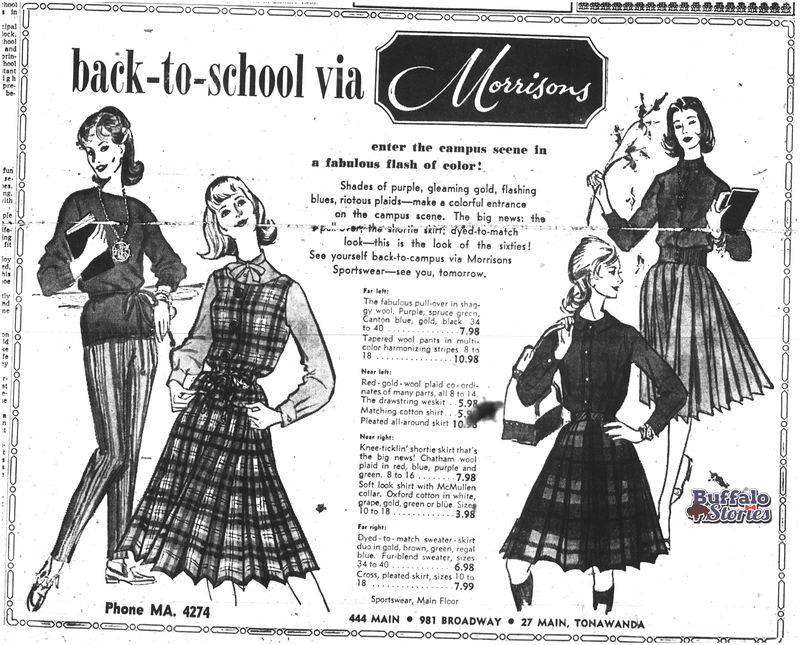 JN’s closed up in 1959, so AM&A’s moved into the larger, newer building. 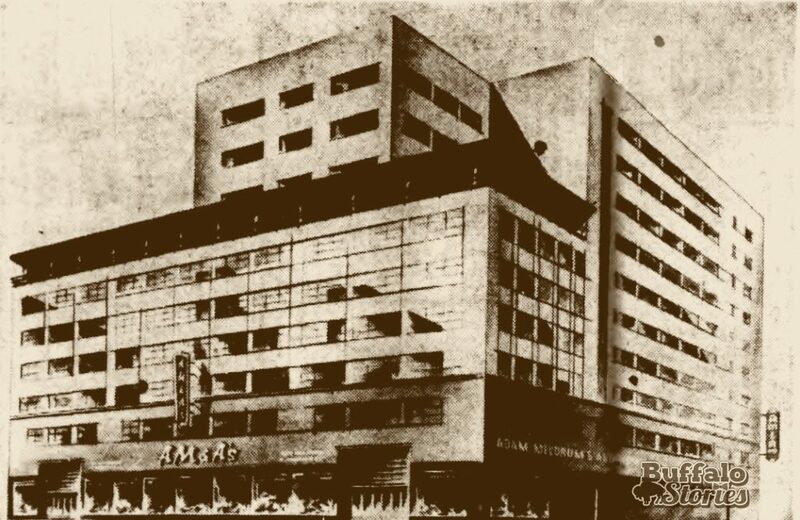 Soon thereafter, the original AM&A’s was torn down to make way for the Main Place Mall. Adding to confusion is the similar name of the two stores. 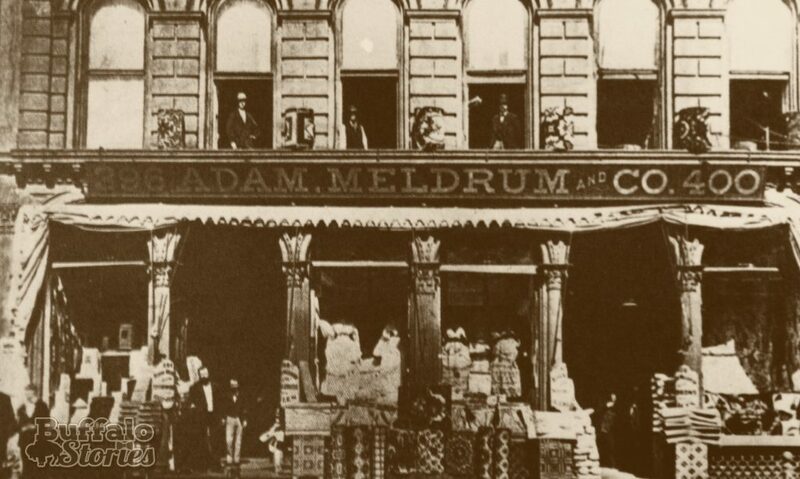 JN Adam and Robert Adam—the Adam of Adam, Meldrum & Anderson—were Scottish-born brothers who founded department stores which would eventually compete with each other across Main Street from each other. Both stores also took their window decorating—especially Christmas window decorating seriously. 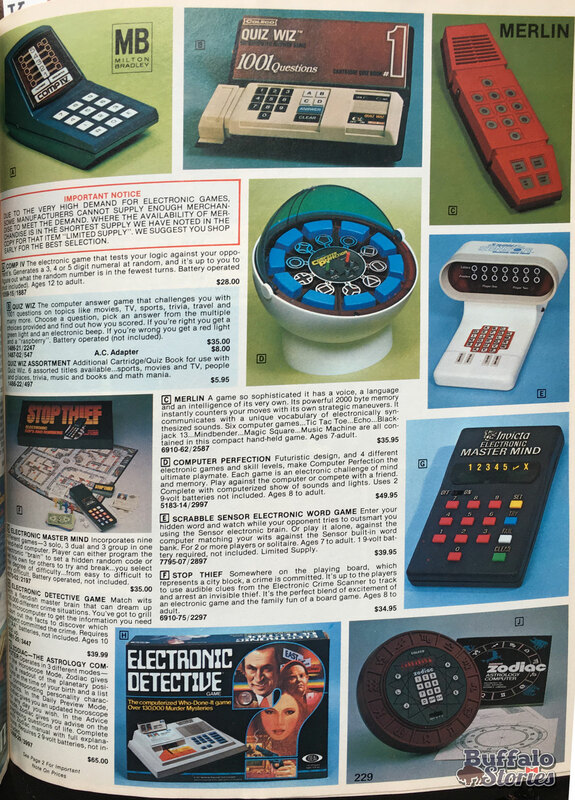 But so did all the Main Street Department stores. 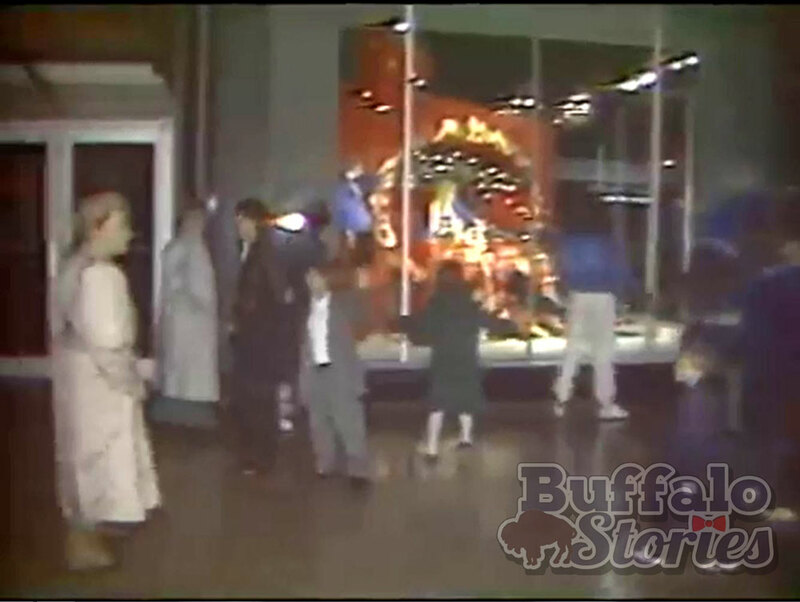 On the same block as JN’s and AM&A’s, Kobacher’s, which had a location in a spot now occupied by the Main Place Mall, had a memorable giant animated, talking Santa in its window. Hengerer’s, a bit further north, always had well decorated windows. 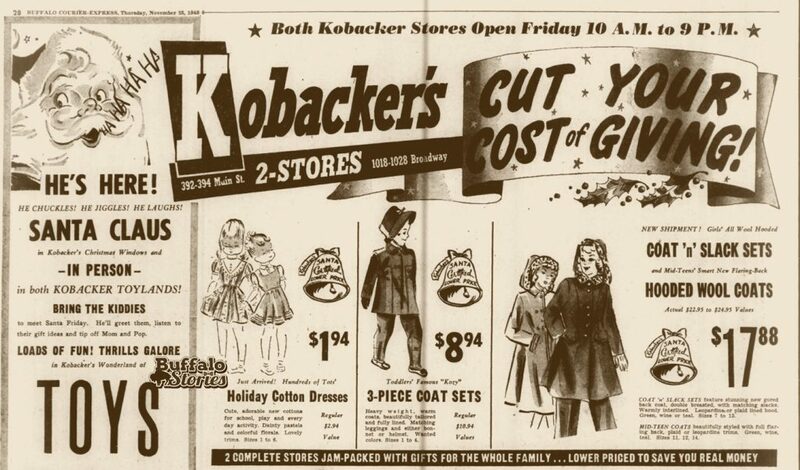 “Kobacher’s each Christmas propped a huge, stuffed Santa Claus in its front window. This Santa rocked and bellowed a half-witted laugh that throbbed up Main Street. 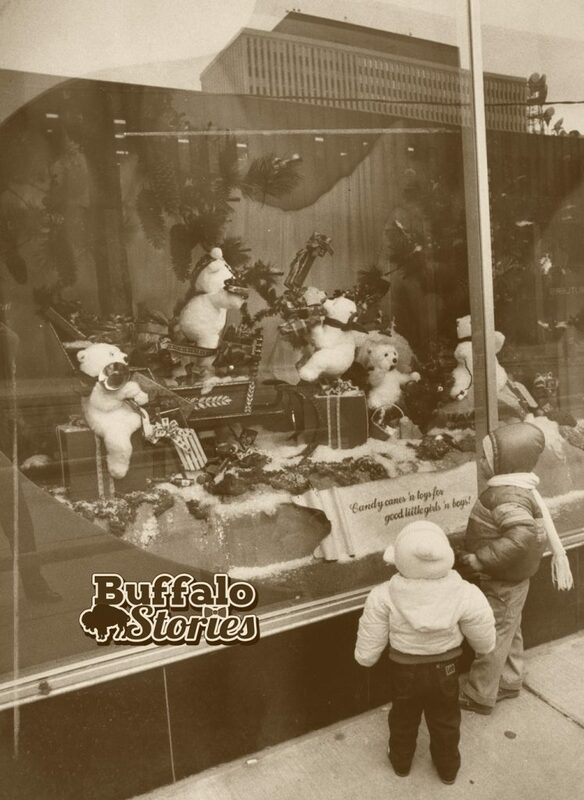 The puppet’s eyes rolled, and shoppers smiled grimly because the general effect was a little spooky,” wrote the late Buffalo storyteller and pop culture historian George Kunz in 1991. 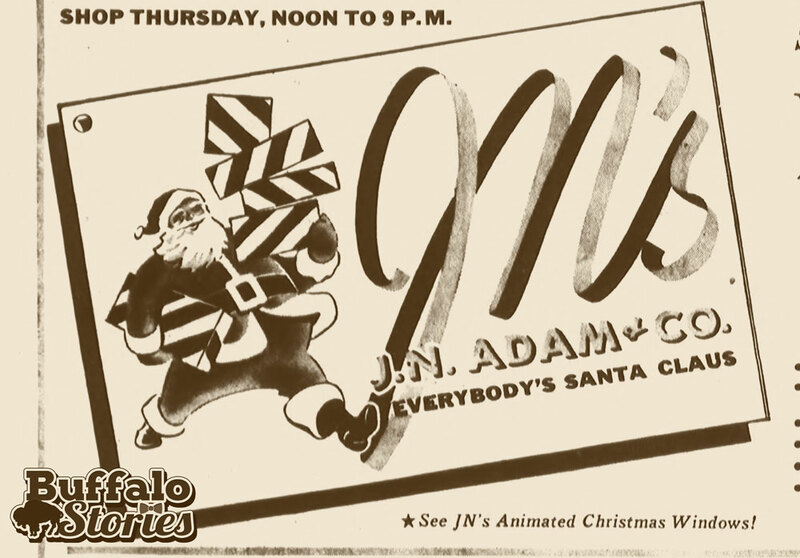 AM&A’s decorating team, eventually headed by Joseph Nelson, started adding animated displays as well, although it wasn’t until the 1960s—after AM&A’s moved into JN Adam’s old space—that AM&A’s made the presence of the windows a part of their Christmas advertising. 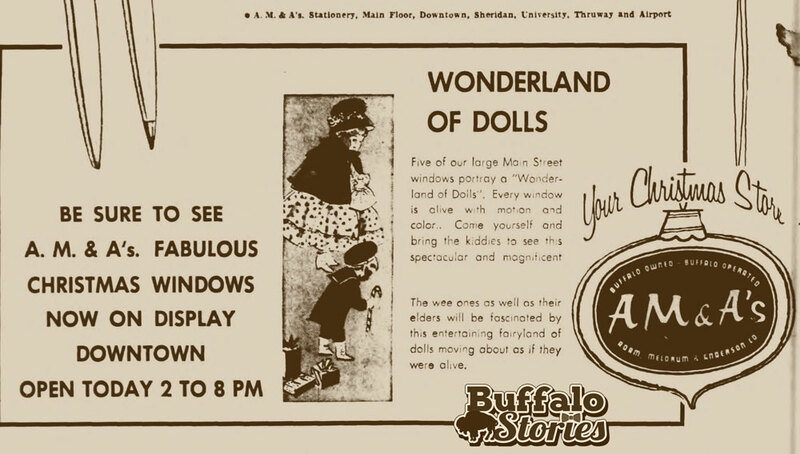 It’s tough to tell even if the “AM&A’s window displays” which have popped up around Western New York over the last couple of decades were originally created for and by AM&A’s. 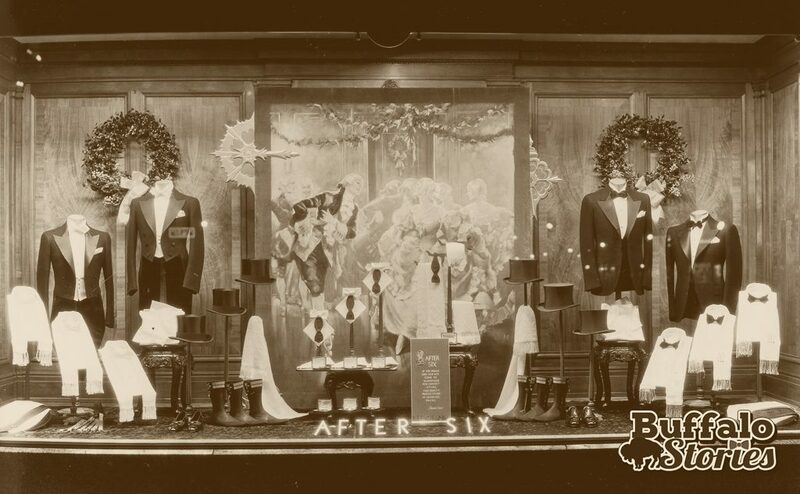 AM&A’s took over not only JN’s building, but also many of its traditions, and quite possibility the actual displays and accoutrements of those traditions. 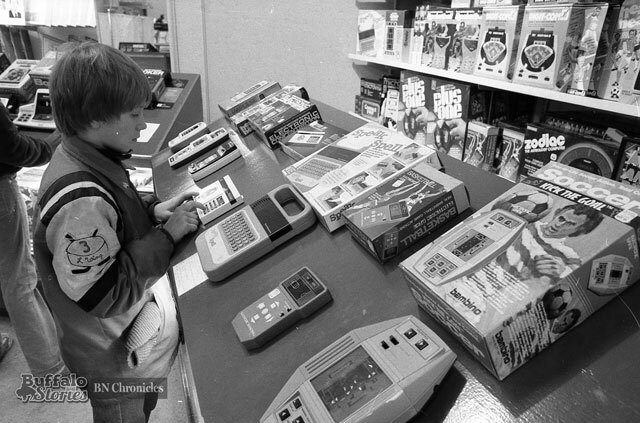 Another JN Adam yuletide tradition which also became an AM&A’s tradition after the move was the full-floor Toyland. All this is to say, if you walked down Main Street in mid-December 1955, the magic and wonder you were filled with was only partially Adam, Meldrum, and Anderson-inspired. But AM&A’s was the survivor—which is why we remember. 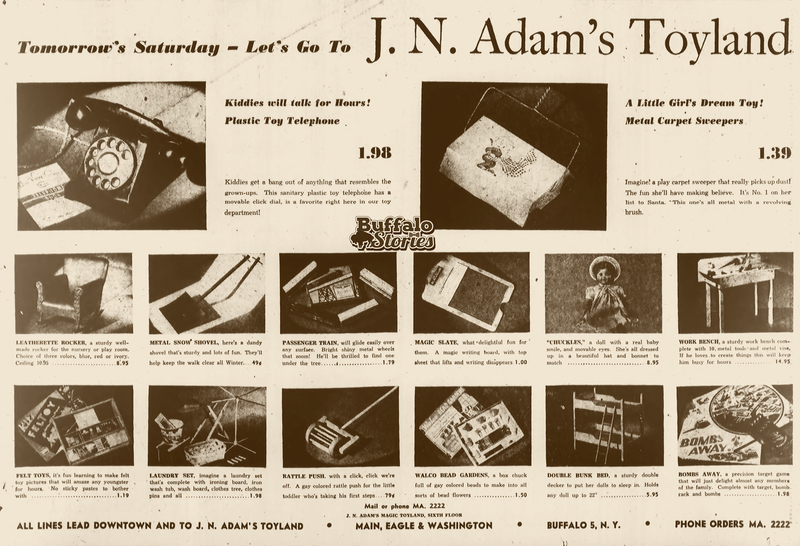 But just keep in mind– it’s very likely that 1955 window you remember was a JN Adam’s window. 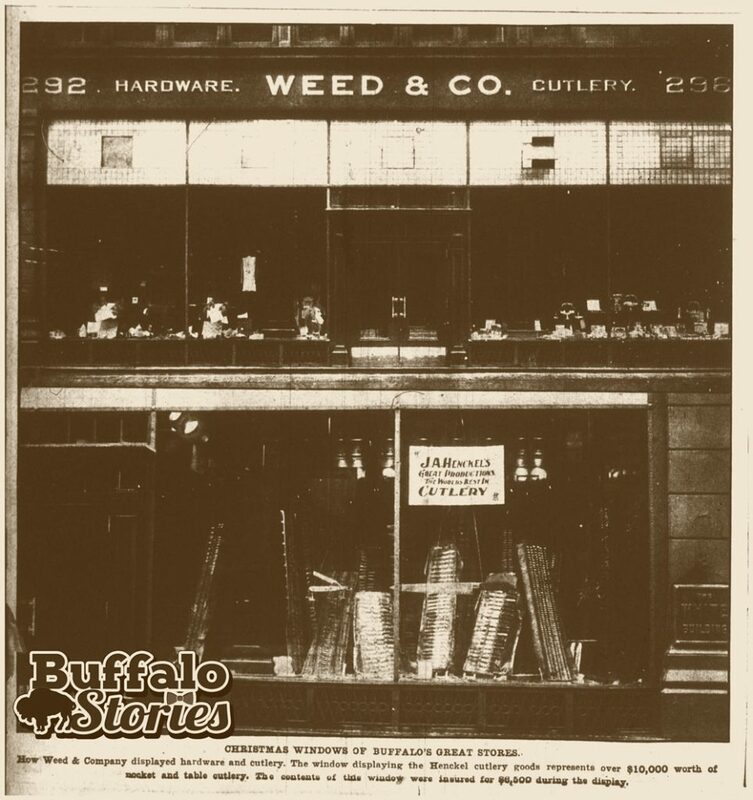 But no matter which store displayed these windows when, they have always been a universally beloved Buffalo institution, right? Well, once again… not exactly. As traditional Main Street retailing was gasping its last breaths in the late ‘80s and early ‘90s, the Christmas windows were often derided as a part of the larger problem—rehashing the same ideas instead of trying to appeal to a new generation. 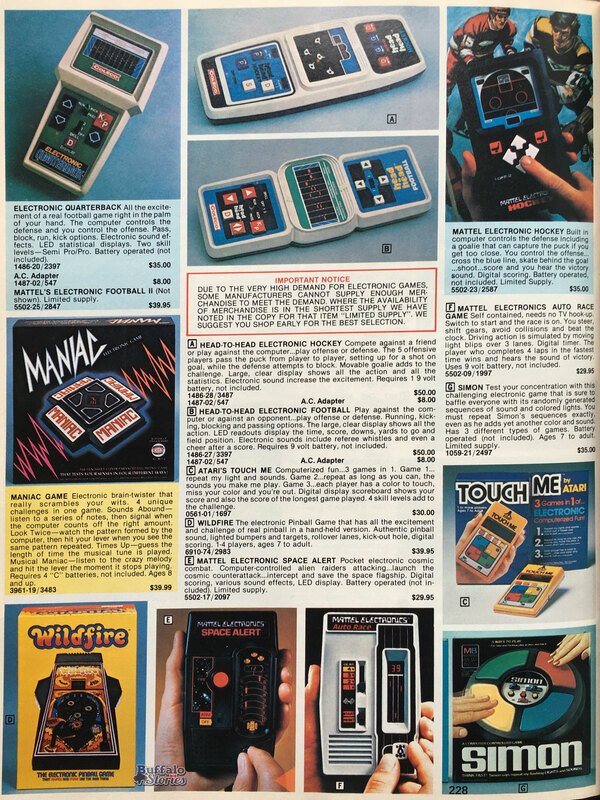 The dated, tired animatronic scenes seemed out of place and woefully out of date in the Nintendo age. 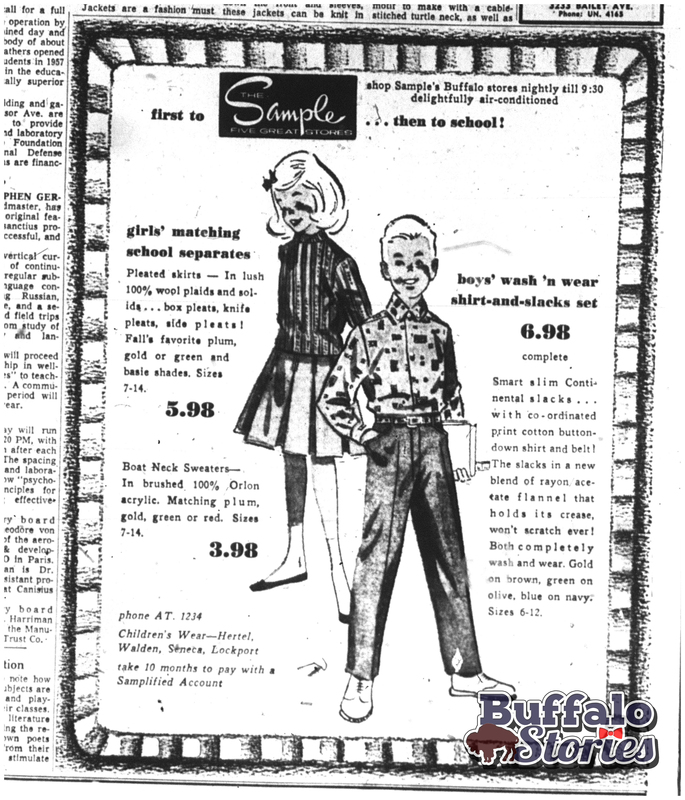 When this snarky review of AM&A’s holiday decorating efforts appeared in The Buffalo News in 1993, the writer probably didn’t realize he was looking at the penultimate effort of a nearly-dead Buffalo institution. (And) at AM & A’s downtown, the other holiday windows display a charming mixture of images, though if any community actually tried to build like this, folks would be petitioning for a design review board before the developers knew what hit them: New England covered bridge here, rough-hewn alpine furnishings there. One window features a frilly pink Victorian cottage that looks as if it could have been plucked off a side street in Allentown. 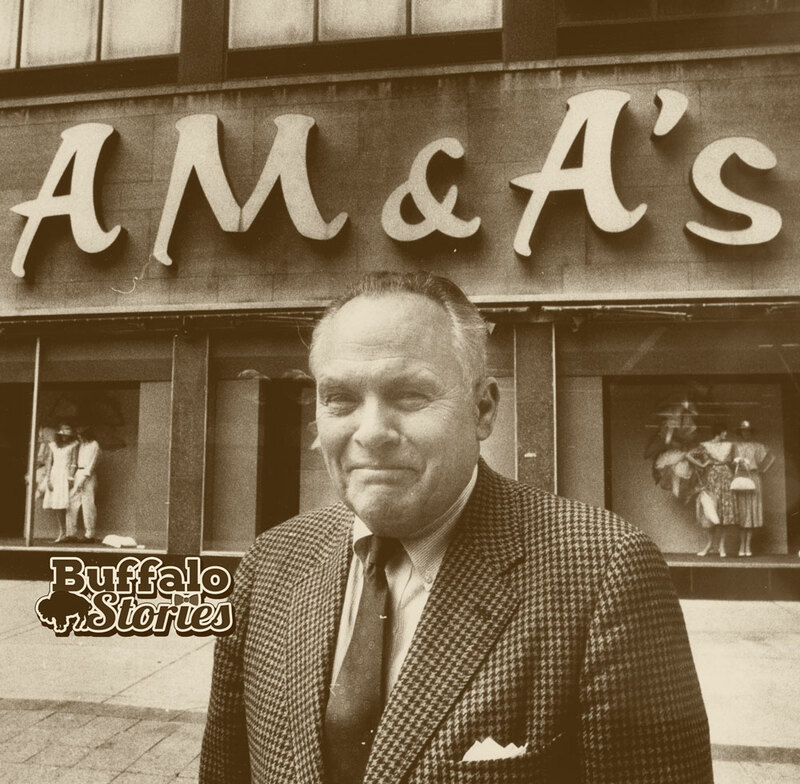 Since AM&A’s flagship downtown store was closed shortly after selling to Bon-Ton in 1995, the legend of the window displays—and the actual displays themselves—have spread far and wide. 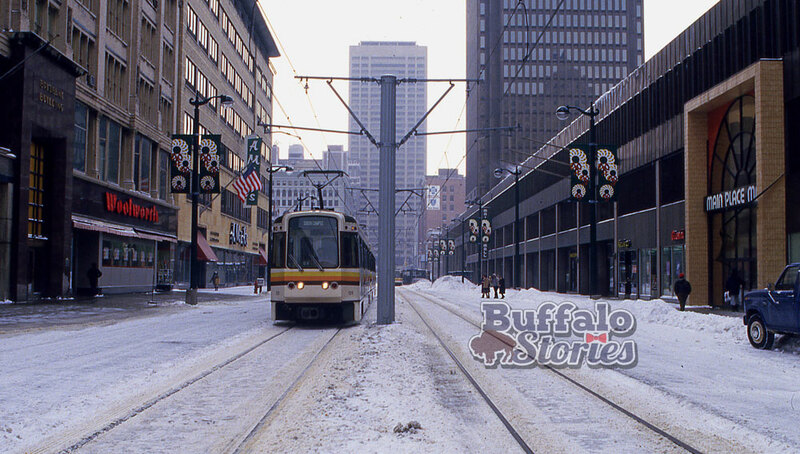 In the mid-90s, Buffalo Place refurbished and displayed the most-recently-used scenes along Main Street. Some of those, along with older scenes as well, have appeared around Western New York in holiday displays in the Village of Lancaster and in Niagara Falls, as well as around Rotary Rink near Main and Chippewa. The actual displays are interesting, but seeing them out of context—or even worse, trying to pry an iPad out of the hand of a toddler so she can appreciate them—seems to miss a bit of the point. A Victorian man carving a turkey or a big white bear handing another bear a present isn’t what make those memories so wonderful—it’s the way the memory swells your heart. Here’s to whatever makes your heart swell this Christmas season. 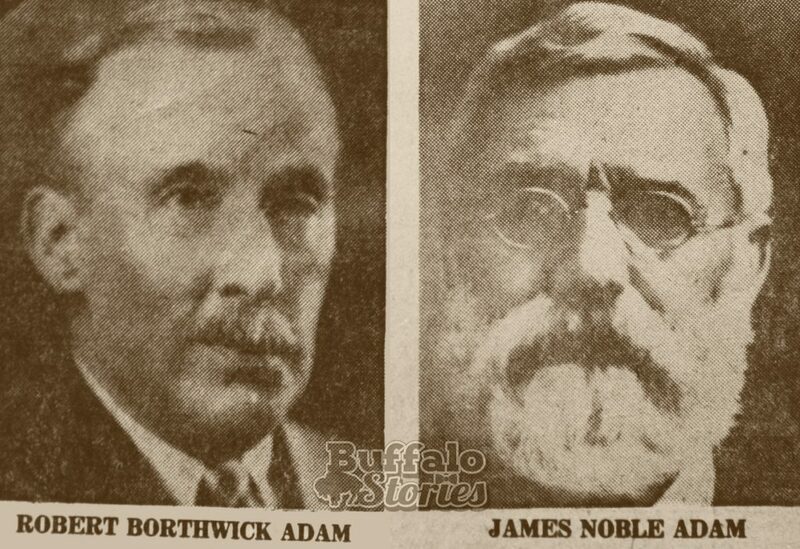 They were two of Buffalo’s favorite up-and-coming announcers and emcees during the 1930s on the Buffalo Broadcasting Corp.’s WGR Radio. 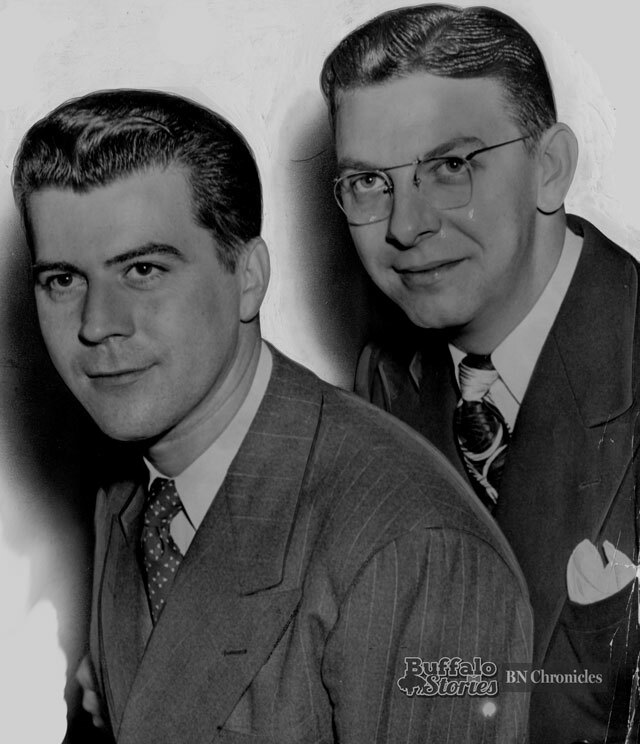 When The Buffalo Evening News wanted to wrestle away WGR’s top rating for its own station, WBEN, it was Clinton Buehlman (left) and Smilin’ Bob Smith (right) they hired. 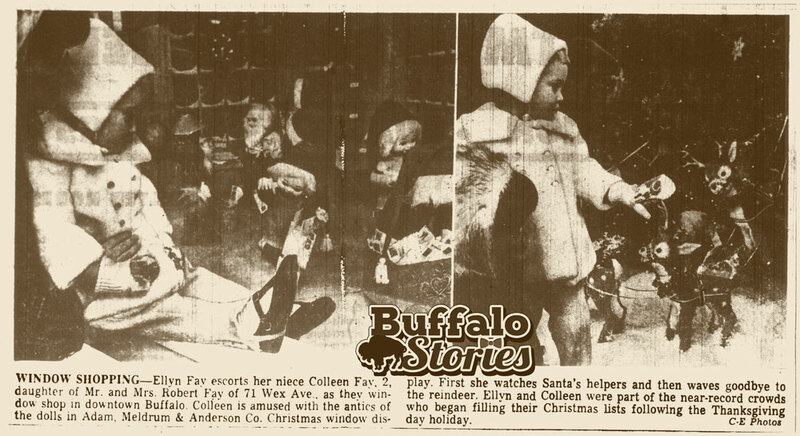 Buehly and Smith, along with Johnny Eisenberger (who was later better known as Forgetful the Elf), were lifelong friends who grew up together on Buffalo’s East Side. 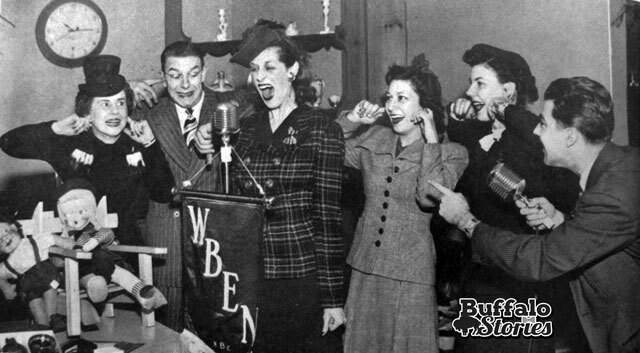 When they were brought to WBEN from WGR in 1943, Buehlman hosted the early morning show and Smith did mid-mornings. 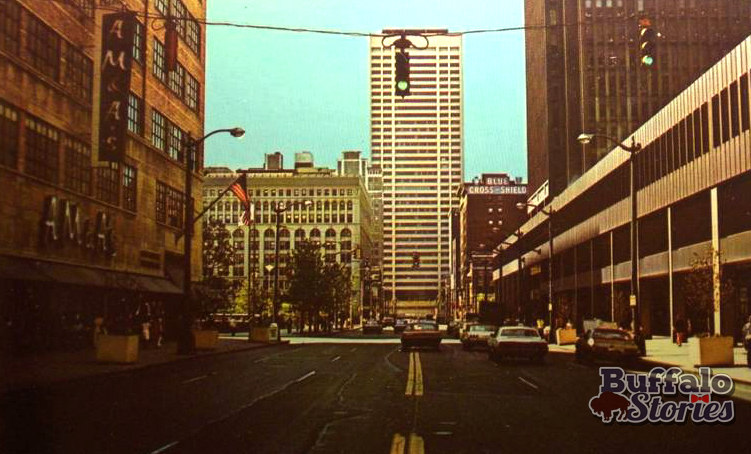 In between their own programs, they co-hosted “Early Date at Hengerer’s,” live from the downtown department store. While Buehlman’s pace was fast and his persona was slapstick, Smilin’ Bob was more laidback and homespun. 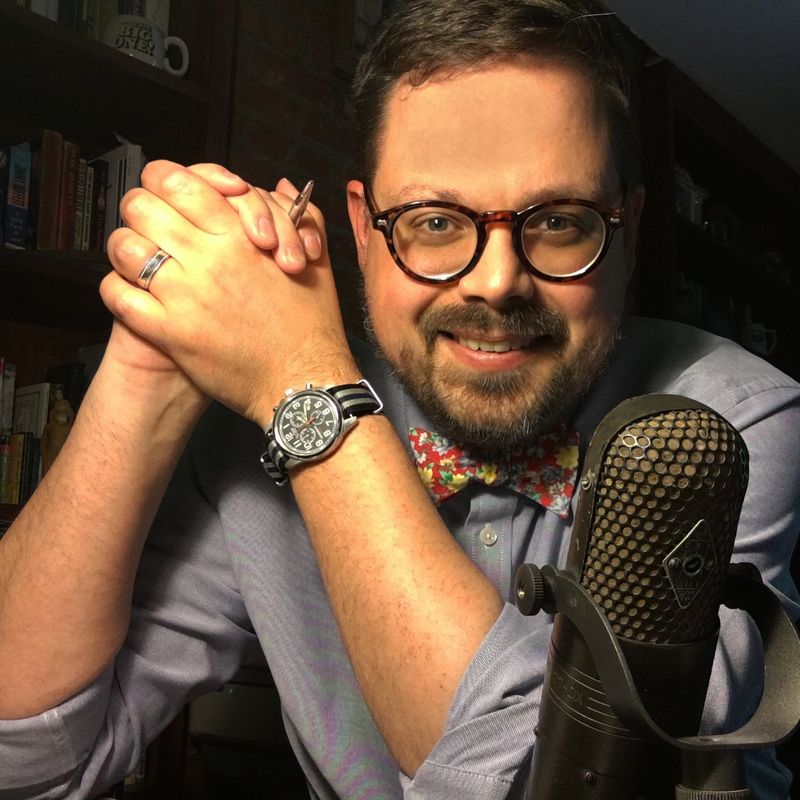 He caught the ear of NBC executives in New York City looking to build a team for the network’s Big Apple flagship station. The show, of course, was Howdy Doody, and Smith was destined to become one of the great early stars of television. Here’s a look at the building boom in West Seneca just off Thruway exit 55 in 1968. 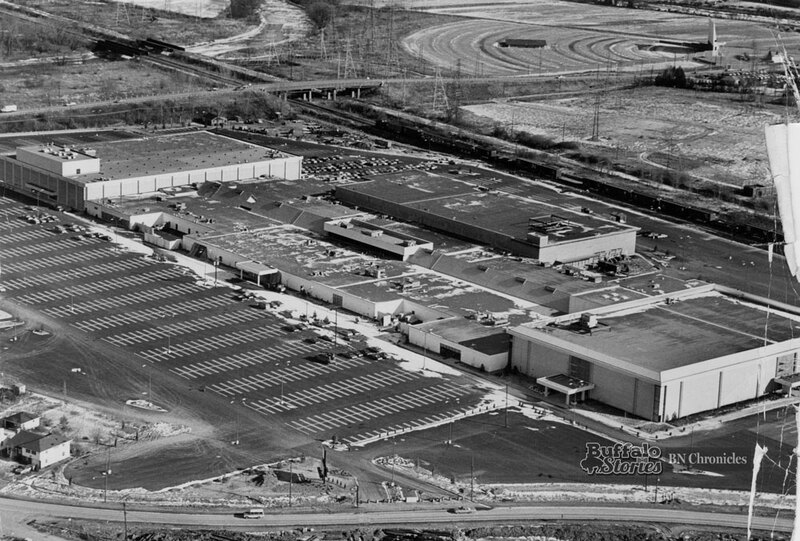 This is the 51-acre Seneca Mall site about three months before the first stores opened in the spring of 1969. 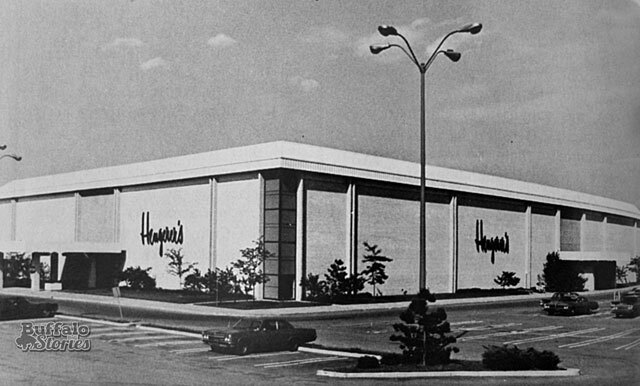 The 53-store project was one of the largest development projects started in Western New York in 1968. Among the main tenants of the mall were the William Hengerer Company and JC Penney. Hengerer’s was in the spot to the right in the overhead photo closer to Ridge Road, and Penney’s was on the other end closer to Orchard Park Road. 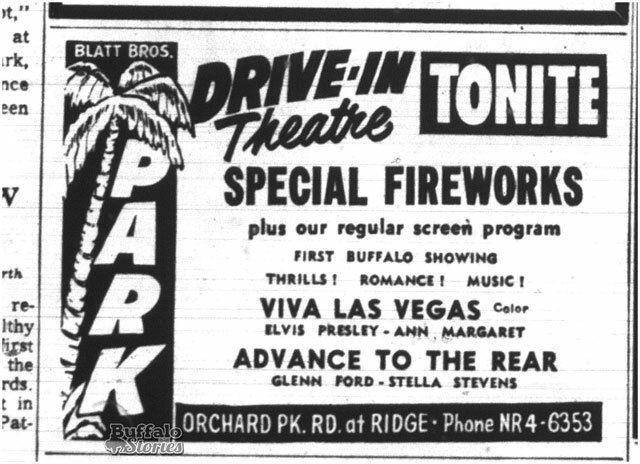 Across Orchard Park Road and over the bridge was the Blatt Brothers’ Park Drive-In. The Park Drive-In was taken down in 1988 and work began on a $6 million medical park currently on the site. It took several years to tear down the abandoned Seneca Mall, with most of the work done in 1994. Tops Markets and Kmart now fill part of the mall’s footprint. The grass field at the top left of the overhead photo is now the site of Wegmans. 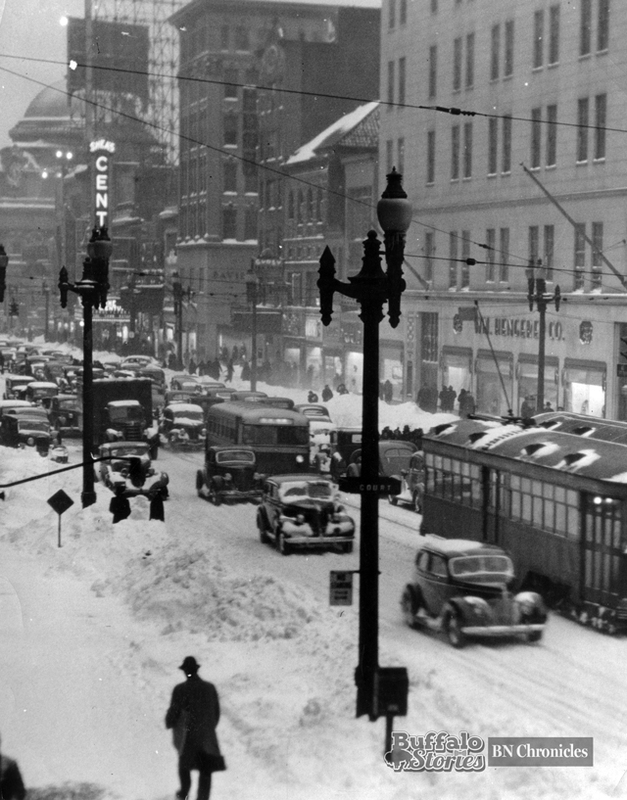 Snow-covered streetcars, buses, cars and pedestrians share the 400 block of Main Street with Hengerer’s, Shea’s Century theater and Buffalo Savings Bank’s gold dome in this shot from 77 years ago. 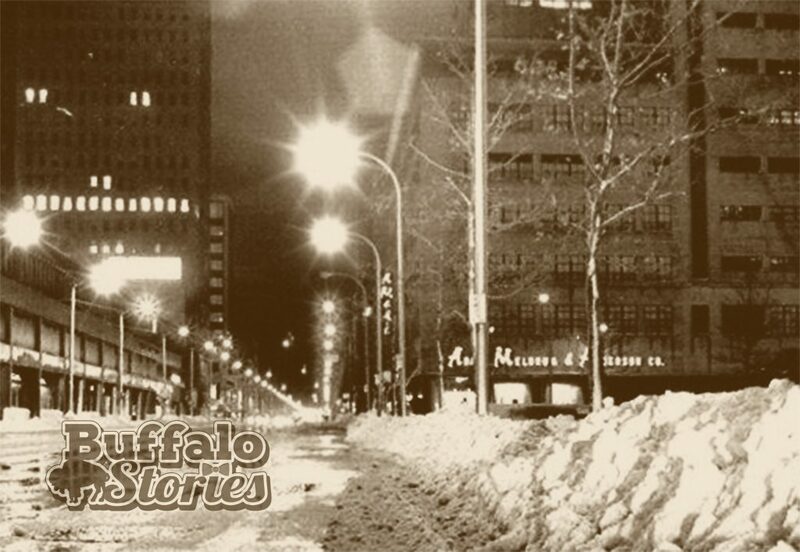 On Jan. 30, 1939, Buffalo was dealt a surprise 8.5 inches of snow. 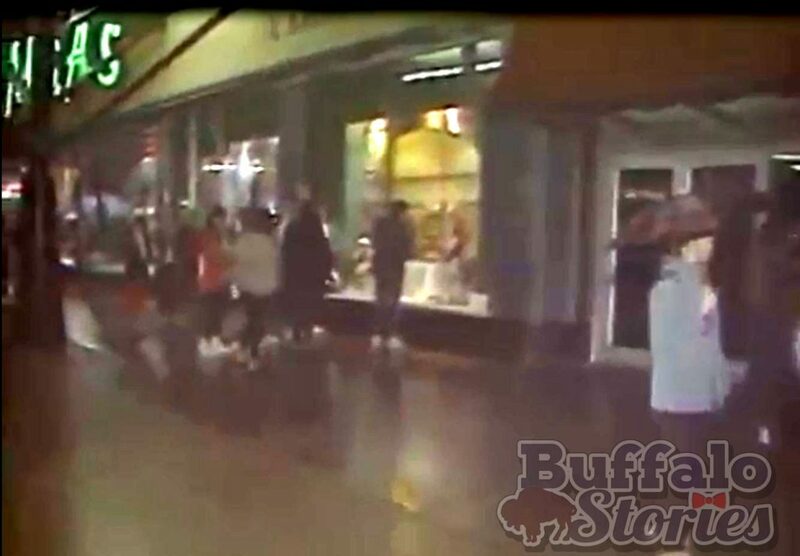 Two people died as a result of the storm — both as they drudged through the weather on downtown sidewalks. The fact that news accounts mention that the weather event was not an official blizzard, leads one to believe the storm was wicked enough to use the shorthand of “blizzard” whether it strictly fit the meteorological definition or not. 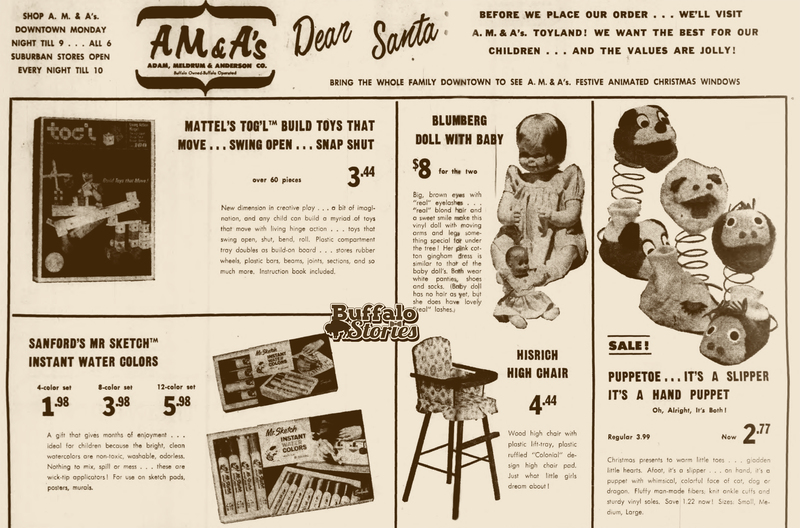 From 1948 to 1973, the children of Buffalo knew who the one, true Santa was — and it was the guy who read their letters on Channel 4. 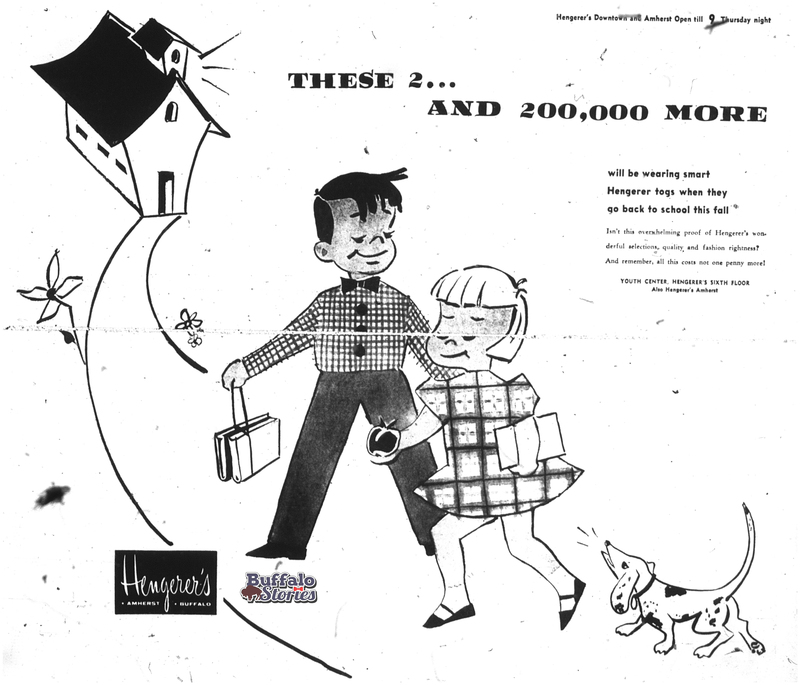 During most of the 25 years the show aired, Hengerer’s sponsored the show to run from Thanksgiving to Christmas Eve for 15 minutes on weekdays, a little longer on Saturdays. 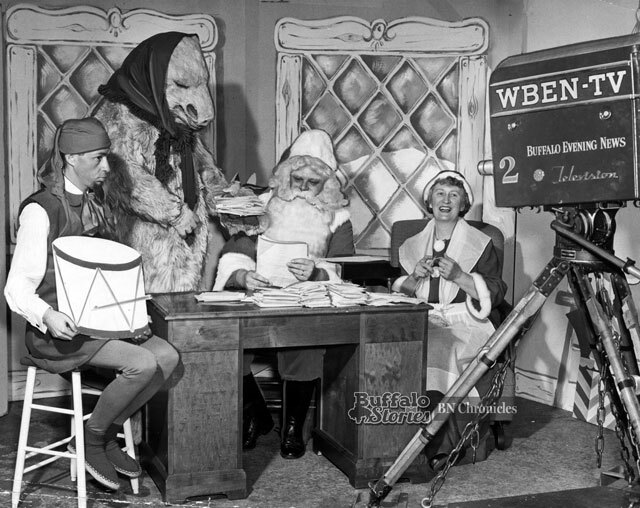 In 1956, the show that delivered approximately 50,000 letters to Santa through its run became Buffalo’s first locally-produced show regularly presented in color. Two men played Santa on Channel 4. Announcer Ed Dinsmore was the first St. Nick from the show’s inception until his death in 1954. Station program director Bill Peters — who was also known on the Van Miller Show as Norman Oklahoma — played Santa from 1954 until the end of the show’s run 19 years later. Santa, however, was barely the star of the show. 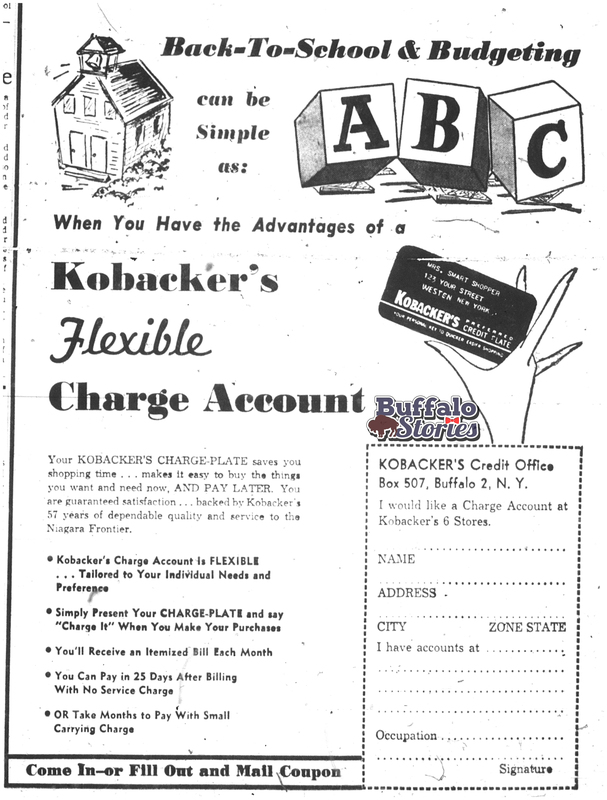 Forgetful the Elf, played memorably by WBEN copy writer John Eisenberger, was there for the entire run of the show from 1948 to ’73. Not only was the elf he played forgetful, but he was silly. Most shows revolved around Forgetful trying to paint Santa’s sleigh with polka dots, or trying to convince Santa to get rid of his “old fashioned” red suit for something as bit more modern. Hundreds of times through the show’s quarter century, Forgetful was seen greasing up the reindeer’s antlers, with the hopes of making them go faster. This clip is the only known remaining video from the long run of the Santa show. It’s not from the broadcast of the show– but from 8mm home movies shot by a Channel 4 crew member. 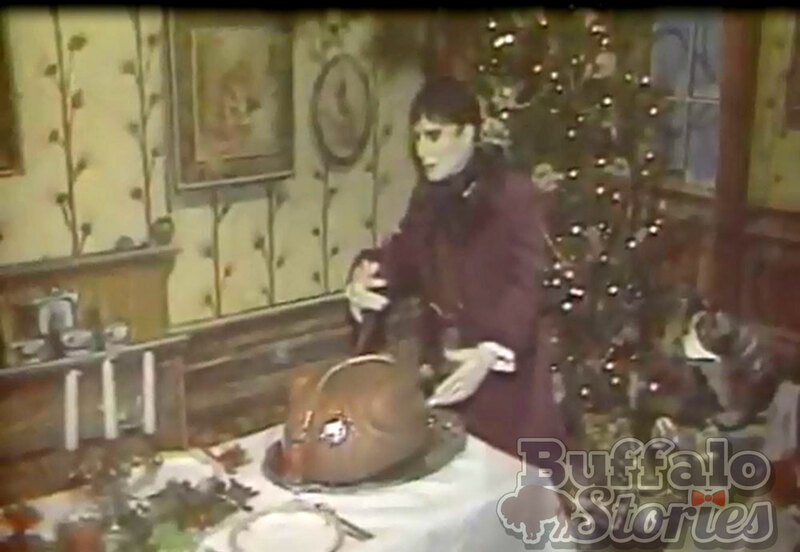 This brief video shows Peters as Santa, Eisenberger as Forgetful, and Brook as Grumbles. The soundtrack for the film is Leroy Anderson’s “Sleigh Ride,” which was used as the show’s theme song. 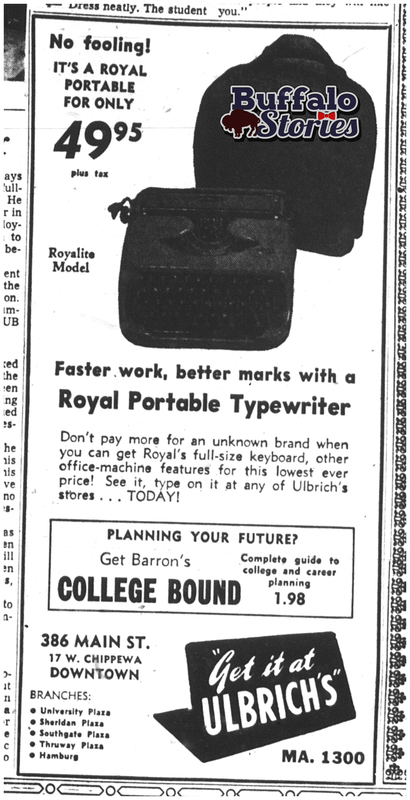 It was also frequently used during the Christmas season by WBEN’s legendary morning man Clint Buehlman. No full episodes or even short clips of this show — which ran for 25 years — are known to exist. The show was usually presented live, and recording was a more costly and difficult endeavor than it is today. Santa and Forgetful had plenty of helpers through the years, all of whom — just like Peters and Eisenberger — had other jobs around the station. Grumbles the Elf was played by executive director Gene Brook and then floor manager Bud Hagman. Another director, Warren Jacober, played Freezy the Polar Bear. There were countless other puppets and guest stars, but none rising even close to the popularity of Eisneberger’s Forgetful. The show ended along with Bill Peters’ death in 1973. 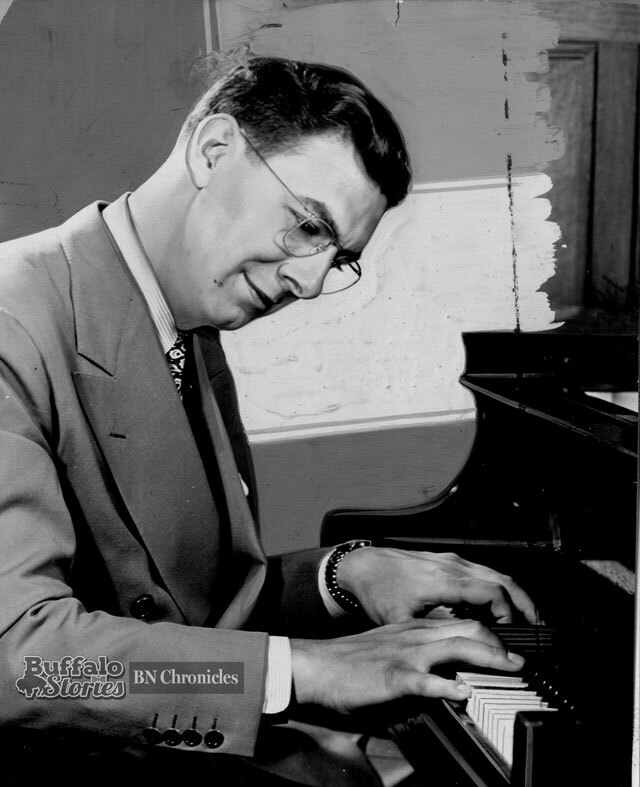 Eisenberger died in 1984 at the age of 72. 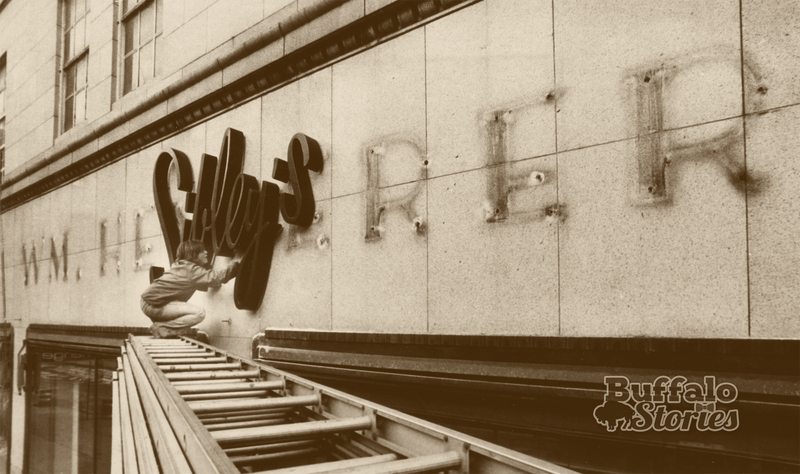 It was November 5, 1981, when the sign for the William Hengerer Company was replaced by Sibley’s. 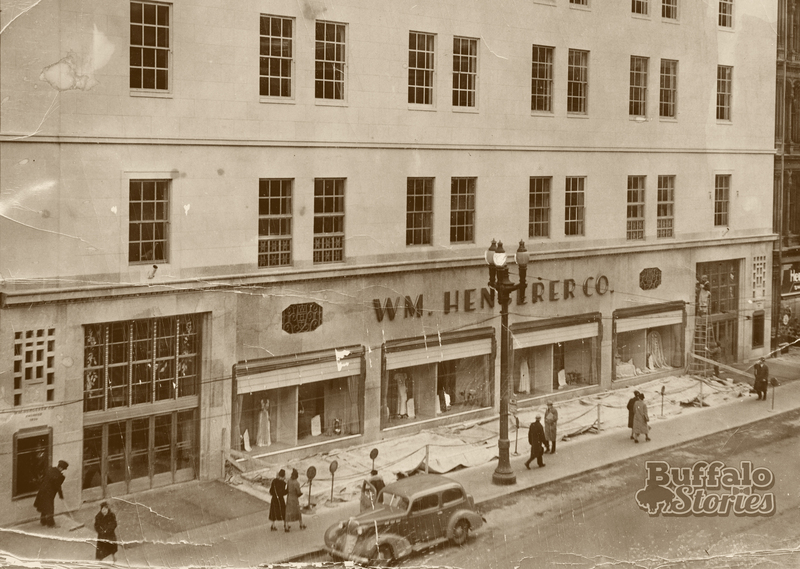 Hengerer’s had been in downtown Buffalo for 105 years when the name was changed. 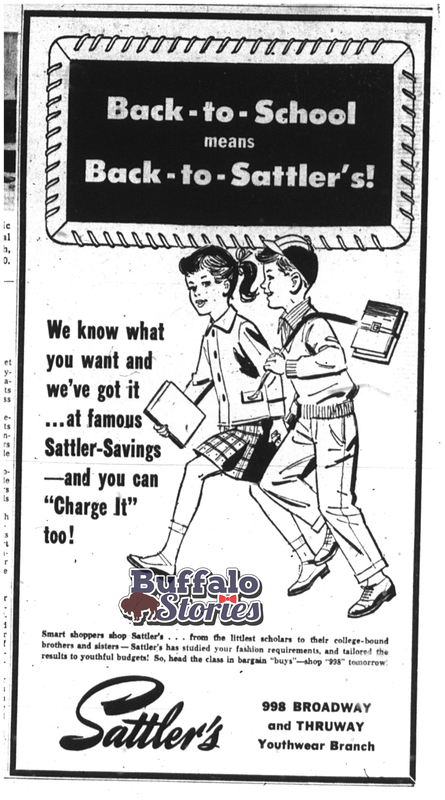 Buffalo’s Hengerer’s and Rochester’s Sibley’s had long been owned by the same parent company. 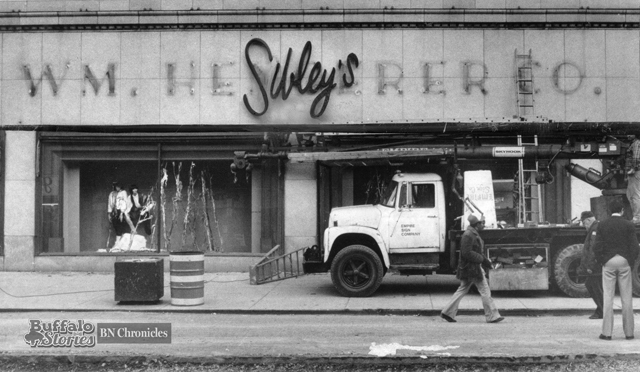 The downtown store in this photo was closed in 1987, and Sibley’s was eventually merged into Kaufmann’s in 1990. Most remaining Kaufmann’s locations became Macy’s in 2006.